Hello and welcome to my stop on the Lasting Hearts Blog Hop! 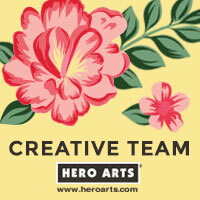 If you have arrived from the Hero Arts Blog, you're in the right place. 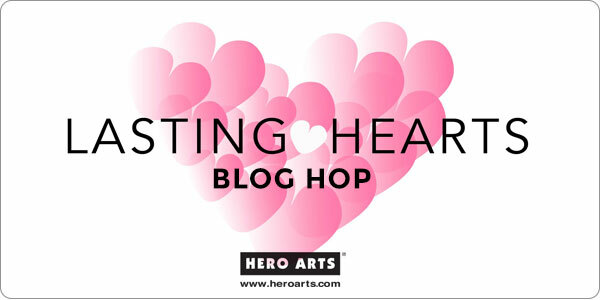 If you haven't been to the Hero Arts Blog yet, I highly encourage you to go there and read all the great information about this cause and ways that you can support it through the wonderful hobby of cardmaking. So today I have created three cards using the Mother of all Mothers stamp along with one of the heart dies from the So Sorry Stamp + Cut. I used Zig Clean Color Real Brush Markers to create a gradient of color on a strip of watercolor paper and then die cut six hearts. Then I stitched the hearts down the side of a white panel using gold thread. To go along with the gold thread, I gold heat embossed this beautiful message. I popped up the white panel on a colored card base so the hearts appear as they are floating off the edge of the panel. And then I finished off the cards with a scattering of Darice Crystal Sequins. Be sure to visit all the stops on the hop and leave a comment! Hero Arts is giving away a special prize to three lucky commenters – Angela Miller’s “You Are the Mother of All Mothers” book, as well as the So Sorry Stamp & Cut set. Please comment by Sunday, March 6 at 11:59pm PT, and they will announce the winners next week. Your next stop on the hop is the amazing Sandy Allnock! Love the cards! Great idea to do the watercolor gradient sheet and then cut out the hearts. I love that you stitched them onto the card and then matched the stitching with embossing color! Beautiful! What beautiful cards. I love how you did the heart borders. Beautiful and so creative. Also, the campaign is amazingly sweet. super pretty, love the different colors you used. Love these beauties, Kelly! Your watercolored heart borders are amazing! Gorgeous card set! Beautiful cards! Love the different colors of each of them! Thanks for sharing! Wow love those 3-d hearts and your designs! The ombré hearts and stitching are so classic...how beautiful. This new set is a keeper. What a lovely idea! Beautiful! So beautiful and creative, love the stitched hearts border! What a wonderful idea with the hearts, it is so unique. I've never seen anything like it. Gorgeous! Absolutely beautiful cards for a very worthy cause. Such beautiful cards! The hearts along the side are so pretty. Thanks so much for sharing. What precious strings of hearts! Your design is beautiful and the ombré hearts finish that edge nicely. Beautiful, simple card. I am inspired to make another batch for the drive. What a simple but lovely card! It's almost in my skill range, except for a straight row of stitching! Thank you so much. Love the card - How do you do the stitching? Beautiful cards. Love how the hearts border the opening of the card. So pretty! These cards are simply elegant! I love the soft color palette you used but then the gold brings a certain touch of elegance to the cards. Just lovely. beautiful cards. A lovely way to showcase this cause. These cards are just beautiful. I would love to buy one to frame. I had a loss three months ago at 20 weeks, so I would love to have a copy of Mother of all Mothers. Love you cards Kelley. So nice. I love your CAS design and stitched hearts borders. Beautiful! Beautiful cards, and such a great heart-felt cause to support. I just love your colourful hearts. Such happiness. What a pretty and sweet card! Beautiful cards, with the colored hearts. Love that detail and the lovely sentiment. Thanks for sharing. Three very lovely and unique cards. Love how you did the hearts. Very pretty cards...love the stitching. I love how the hearts look like they are flying, and the gradient color. Your cards always have such wonderful color combinations! Thanks! Beautiful card! Love the ❤️ Border! Beautiful cards! I love the colors and the stitching detail! Lovely sentiment too! Kelly they cards are, will be perfect for this cause. Gorgeous cards! Love the ombre hearts! Love the stitching on the hearts, beautiful cards! So well done! I am inspired to send in more cards!! This is so pretty. I love the hearts and how you sewed them. Very pretty and simple cards.. These are just beautiful!! Love the floating hearts idea. Going to have to try it sometime!! Love the ombre floating hearts. Great idea!! What a gorgeous card!! I really like the way it looks like it is floating. Great way to use the Zig markers. I'll be borrowing this idea. Thanks for your support for the card drive. Wow!!! What a lovely initiative!!! Your cards are amazing!!!! Love the sentiment!!! Beautiful cards and a much needed idea. So pretty! Love the hearts and colors! What a beautiful idea for those cards. I really love the colors, and of course, the heart warming sentiment. So pretty. You did a wonderful job! Awesome card with beautiful colors in the hearts. I lobe the colors of these cards. Very clever idea and just right for this sentiment. This is a wonderful cause and often overlooked. I'm so glad that more attention is being given to this. The set is beautiful and I hope to see the book in our hospital. What a wonderful idea! I'm in total support. Beautiful cards, Kelly. Beautiful cards...your cards turned out really nice. Love the watercolor hearts Kelly! Just purchased a few of the markers to play with. Wow! What beautiful cards, so creative. Thanks for sharing with us. These cards are so beautiful , delicate, and inspiring. You're right - it is a beautiful message. Love the gradient of colors - beautiful! Very lovely cards. I like the gold stitching and embossing. Lovely cause. I'm busy making cards with some friends. Thank you for the inspiration. Such a beautiful design! I'm sure this will bring much joy to those mothers that face such sadness. Your cards are lovely. I am sure that when it is received it will bring comfort to someone. Thanks for sharing. These are beautiful, Kelly, with your stitched hearts and gold-embossed sentiment! Beautiful cards! I love the watercolored hearts! Beautiful cards, Kelly!! I love the gradient colors of the hearts with the edges "floating" over the strip of the colored card peeking out! The simplicity really makes the beautiful hearts and sentiment stand out! Love what you did with the hearts. Great card and love the stitched hearts down the side. Thanks for sharing. What a great idea! As a labor and delivery nurse I have been in the counseling and comforting side. Having had three miscarriages myself and unable to have children I've been on the grief side. Neither side is easy. But knowing someone cares always help as some point.